The 2014 Dunlop MSA British Touring Car Championship will draw to its conclusion on the legendary Brands Hatch Grand Prix circuit next weekend (11/12 October) with a huge crowd expected to descend on the venue to watch the title showdown between Colin Turkington and Jason Plato. This record breaking BTCC season commenced with the announcement of a capacity 31-car grid, including seven former champions and some of the best touring car drivers in the world. Over the last seven months Britain’s biggest and best motor sport series has provided more thrills and spills than most championships produce in a decade. Ten different drivers have stood on the top step of the podium during the course of the campaign but now after 27 races it all comes down to this – the final triple-header at one of the most illustrious and beautiful circuits on the planet. 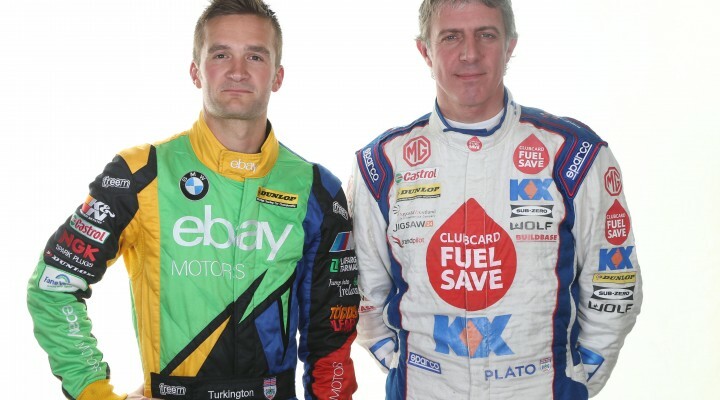 Will it be eBay Motors driver Turkington who secures his second BTCC title or can tin-top legend Plato bag his third championship? It’s not only the Drivers’ trophy up for grabs as MG and Honda battle it out for Manufacturer glory while the Teams’ title is also yet to be decided. There’s sure to be action aplenty and some paint-swapping along the way as this year’s champions are crowned at Brands Hatch. Colin Turkington hasn’t always been the favourite to win the 2014 Dunlop MSA British Touring Car Championship, in fact far from it. His eBay Motors squad initially struggled to find the ultimate pace with reverse grid wins being the team’s target for the first three events of the season. It was reigning champion Andrew Jordan who soared into an early standings lead with many predicting a case of ‘when’ not ‘if’ the Pirtek Racing driver would retain his crown. A mid-season wobble combined with a huge accident at Snetterton, however, ultimately scuppered the 25-year-old’s title ambitions. Honda Yuasa Racing were also in the hunt with its all-new Civic Tourer. Gordon Shedden became the first racer in history to win a BTCC race driving an ‘estate’ style car and it seemed as though the team’s latest machine would only get better. Unfortunately the expected upturn in performance failed to materialise and the marque’s overall challenge has faded in recent rounds. Jason Plato – the most successful driver in the history of the BTCC with 87 wins – was always in contention. Five victories during the season including another double last time out Silverstone confirmed his place as Turkington’s only challenger in the race for the championship. Turkington himself has been flying, particularly since an unstoppable run of form at Oulton Park, Croft, Snetterton and Knockhill set him apart from the chasing pack. The Ulsterman has remained at the standings summit ever since and a podium hat-trick at Silverstone last weekend further bolstered his assault. Plato did, however, reduce the deficit to 50 points (with 67 still to play for) and he can never be discounted. Plato arrived at the 2013 season finale 49 points in arrears of championship leader Jordan and immediately went on to win the first two races. His performances left nearly 40,000 spectators at the circuit and millions more watching on TV holding its collective breath. Although he narrowly missed out at the conclusion of the campaign Plato’s reputation as the driver who can produce the possible from the seemingly impossible means he’ll be as dangerous as ever next weekend. “It’s going to be a nail biter for everybody,” said championship leader Turkington. “I have a good cushion in the points and people talk about having one hand on the title, but one hand is no good – I need to have two on it! “Brands Hatch is a fantastic circuit and every driver enjoys it – I think our BMW will be good there too. MG KX Clubcard Fuel Save is approaching the climax of its third season in the BTCC and for the first time holds the advantage in the Manufacturers’ standings going into the final event. Up against the all-conquering Honda Yuasa Racing, which has won the championship for the last four years, MG has always found it tough to match the consistency of their multiple championship-winning rivals. Drivers Jason Plato and Sam Tordoff have often been the class of the field but the good days have been mixed with indifferent ones where top points have been hard to come by. Despite the ups and downs of the BTCC still playing its part in the 2014 campaign, the British marque has finally found the required performance to edge ahead of Honda. Plato’s dominant double at Silverstone puts MG in the driving seat going into the finale but nothing can be taken for granted in the toughest championship in Britain, particularly when you’re taking on the might of the Japanese marque. It doesn’t get more local than having your factory base less than a mile from the circuit, which is exactly the position of Wrotham squad Motorbase Performance. All told the Airwaves-backed outfit has enjoyed a stellar 2014 season with Mat Jackson taking two wins, while returning former champion Fabrizio Giovanardi has scored a podium and many headlines. Young stable-mate Jack Clarke has also performed well in his maiden BTCC campaign – the Surrey driver improving with every event culminating in his first top ten finish at Silverstone last month. By its own admission the team has just fallen short of an overall championship assault but they’re certainly a contender for ‘best of the rest’ bragging rights. Two wins and three rostrums from the last five events for Jackson is the sort of form that the vast majority of the BTCC grid can only dream about, but now the team is focussed on finishing the season on a high before a hard winter’s work begins in preparation for a 2015 championship challenge. “We’ve been there or thereabouts,” said Team Boss David Bartrum. “We’ve maybe just not had quite enough to challenge for the championship and we’ve also had some unfortunate days. Winning the title is why we are here and plans are already well underway to develop further for 2015. Three BTCC races will take place on Sunday, with the entire race day being broadcast live and in high definition on ITV4. In addition to the BTCC, there will be a plethora of races on the support bill, which will also see some of the country’s young drivers tussling it out for a number of coveted championships. There will be races from the Dunlop MSA Formula Ford Championship of Great Britain, Renault UK Clio Cup and Ginetta Junior Championship, whilst the high-powered Porsche Carrera Cup and Ginetta GT4 Supercup will also be in action. Tickets for the Dunlop MSA British Touring Car Championship at Brands Hatch are available from £26 with free entry for children aged 13 and under. For more information call 0843 453 9000 or click here to book tickets online. All admission includes access to Sunday’s autograph session with the BTCC drivers in the pit lane as well as free parking.